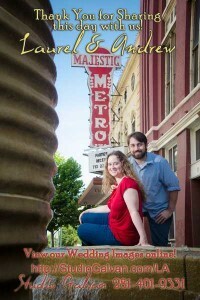 This is my first experience photographing a wedding at the historic Majestic Metro Theatre. A lot of couples are looking for something different. Well this couple is unique and used this historic and beautiful venue to celebrate their wedding! In a week or two we’ll have the wedding photography available here for you to enjoy and if you’d like, to purchase. If you’d like to be notified as to when the wedding images are posted, leave a comment below.